Order our Latest Issue in PDF form (or any issue #57 - #116 + #1, #6, #7, #8, $10, #11, #16, #17, #31) by e-mail, only $5.00 anywhere in the world! Some issues Now Available on Amazon for the Kindle! 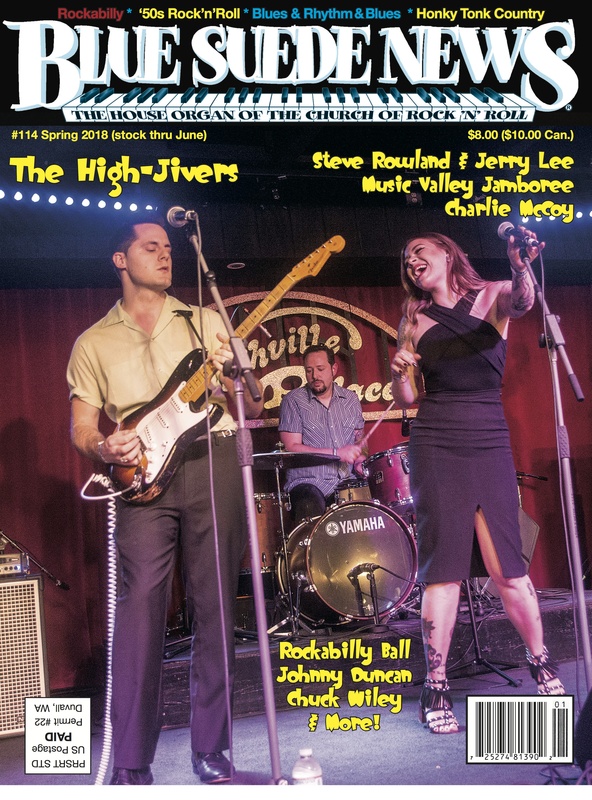 Blue Suede News #114 has a cover story on youg Rockabilly/Blues act the High-Jivers, plus a pictorial and story on the Music Valley Jamboree in Nashville, where they played. We continue our story on Steve Rowland with a long feature about his later career including his production of Jerry Lee Lewis' "London Sessions" LP. We also have stories on piano rocker Chuck Wiley, harmonica wizrd and producer Charlie McCoy, Skiffle meister Johnny Duncan and pictures from Seattle's Rockabilly Ball and other rockin' events up here. Our regular features Tidbit Jukebox, a new feature called Shoulda Been A Hit! and Thrift Store Score are also here along with our extensive reviews section covering Books, DVDs, CDs and Vinyl! only $5.00 anywhere in the world! Send $8.00 (U.S., $9.50 Canada), or $10.00 (Outside the U.S. and Canada) and note which issue you're buying - to Blue Suede News, Box 25, Duvall, WA 98019-0025 U.S.A.
Order our Latest Issue in PDF form by e-mail, only $5.00 anywhere in the world!